Q: FIRST AND FOREMOST, IS THE 2018 KTM 250SX BETTER THAN THE 2017 KTM 250SX? A: Not in any substantive way. There are some suspension tweaks, a frame-color change and new graphics, but since this bike and engine combo was brand new in 2017, KTM was willing to stand pat (and, you could too). Q: HOW MUCH DOES A 2018 KTM 250SX COST? A: The 250SX has a price tag of $7899 (up $200 over last year), while the Husqvarna TC250 costs $7999 (up $200) and the YZ250 retails for $7399 (up $200). 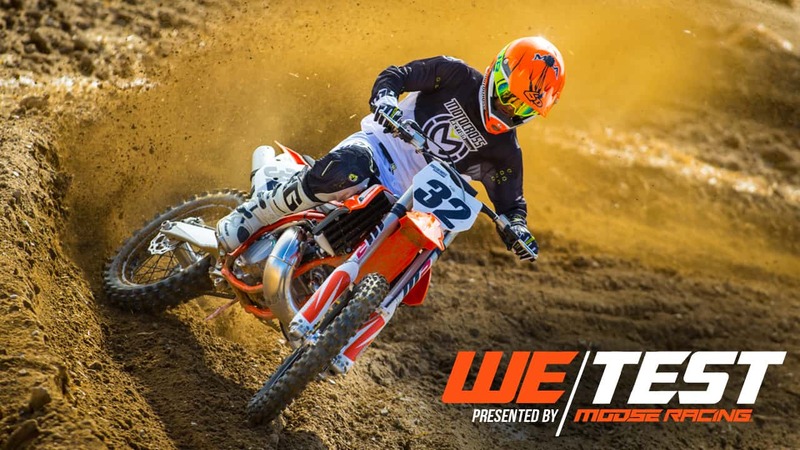 Q: HOW MUCH DOES A 2018 KTM 250SX WEIGH? A: It weighs 212 pounds. The Husqvarna TC250 weighs 214 pounds, and the Yamaha YZ250 weighs 219 pounds. There is something about the stance of a two-stroke with its low-boy pipe, minimalistic engine and lean look that makes it stand out from a four-stroke even before you hear it run. Q: WHAT CHANGES DID KTM MAKE TO THE 2018 250SX? 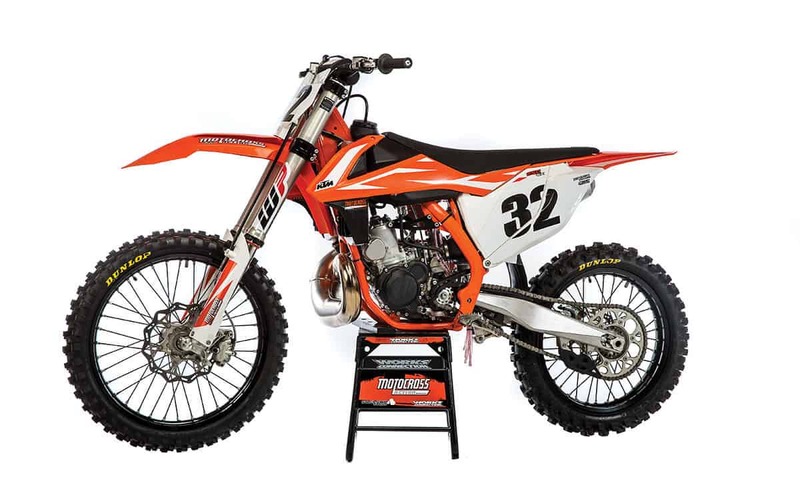 A: Here is a recap of what KTM changed on all the 2018 KTM 250SX two-strokes. (1) WP AER forks. Even though the 48mm WP AER air forks were new in 2017, they got an updated air seal, air-side piston, rebound spring, and a new piston and valving on the damping side for 2018. (2) Shock. The valving on the WP rear shock has been modified to better match the re-valved front fork. (3) Radiator guards. 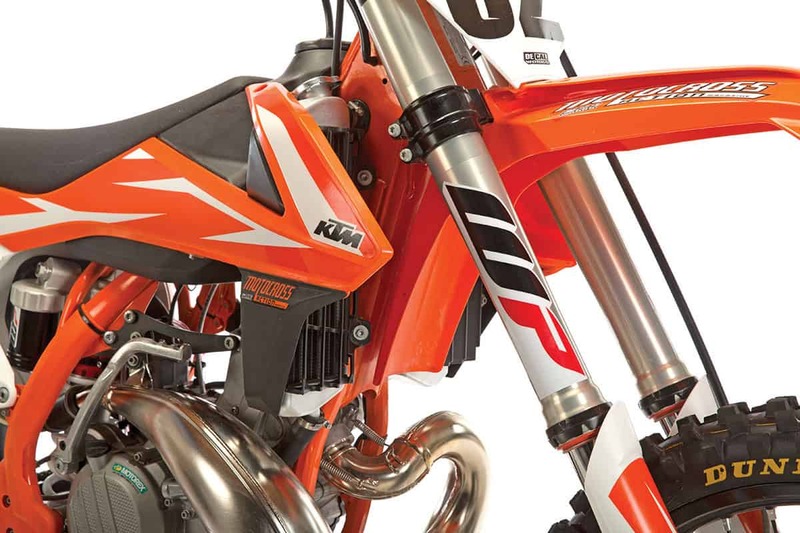 KTM has redesigned the radiator guards to reduce the amount of trapped dirt on the bottom of the guard. The 2018 guards have holes in them to let dirt out. You can upgrade your 2017 radiator guards with a drill. (4) Frame color. The previously black chromoly frame is powdercoated in Factory Team Orange and gets orange frame guards to match. (5) Graphics. The redesigned graphics feature more orange and less white. (6) Carb position. The carb is positioned at a 7-degree angle. If you looked at the engine from behind the carb, instead of being vertical, it would be tilted 7 degrees to help keep the fuel in the float bowl in the proper pickup position. Last year it was set at a 12-degree angle. 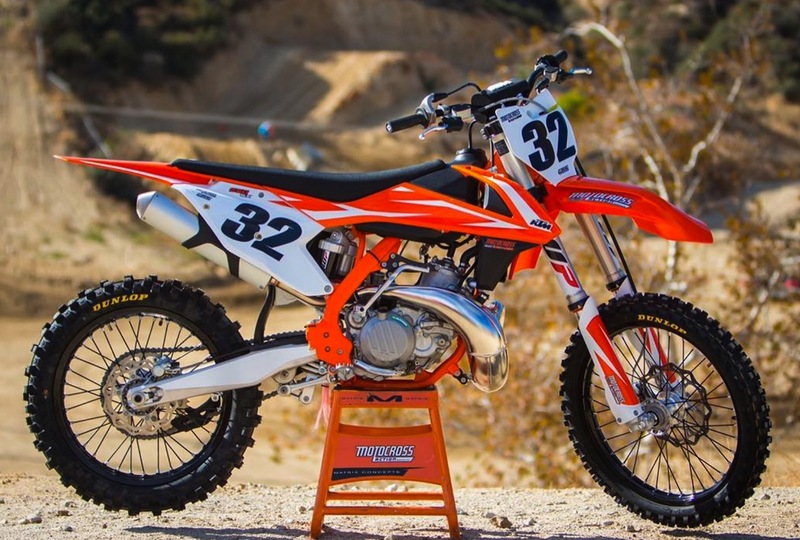 Believe it or not the 2018 KTM 250SX weighs just 212 pounds. If you’re not impressed by that, you will be when you feel how light and agile a 250 two-stroke feels in motion. Q: HOW FAST IS THE 2016 KTM 250SX? A: If we said it was too fast, would you think we were crazy? From the snap of the throttle to the midrange, the 250SX is blisteringly fast. 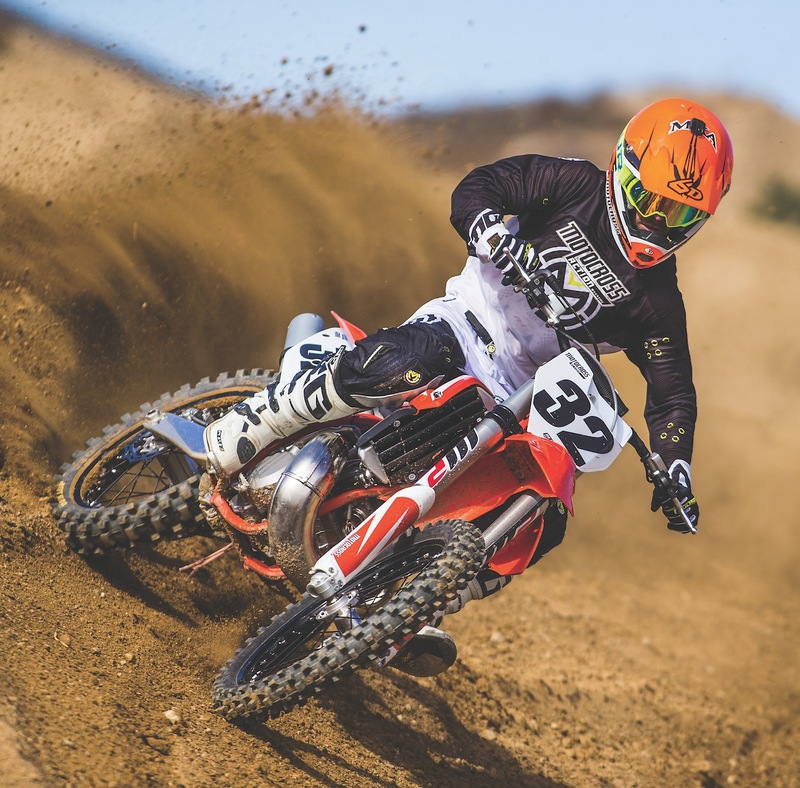 It is fast, abrupt and hard-hitting enough to be hard to manage, especially for any rider making the transition from a four-stroke to the 250SX. The rear wheel would light up from even the slightest movement of the right wrist. With the increased power and the same transmission ratios as the past few years, the 250SX’s shift points, especially from second to third, were extremely short. The engine had ample power from low to mid, but it tipped over very quickly at sign-off. How quickly the power faded and required shifting made for awkward shift points out of the corners. Oh, don’t get us wrong; this gun-and-run style of power, with its need to shift on the bubble, was awesome for skilled two-stroke racers. It was just a little too high maintenance for the less skilled. Thankfully, we found a few simple changes that could alter the powerband and make it more linear, or even more abrupt if that’s your cup of tea. This is an extremely potent powerband. It ramps up fast and needs to be shifted to stay in the meat of the power. Your initial impression of the engine will leave you wide-eyed with a grin from ear to ear; however, as the laps go by, you’ll find it hard to get power to the ground if the dirt isn’t loamy. 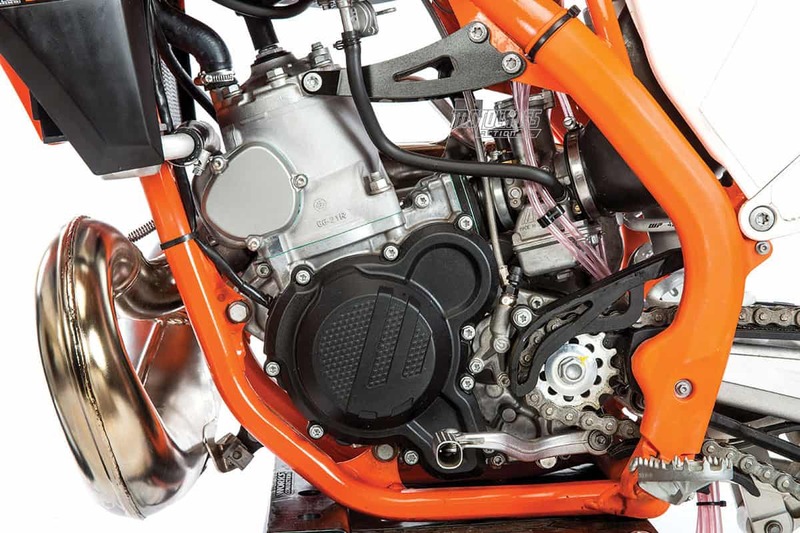 KTM has made 50-horsepower 250cc engines in the past, but this engine focuses on midrange hit and torque. Q: HOW DOES THE KTM 250SX COMPARE TO THE 2018 YAMAHA YZ250? A: The KTM makes 47.20 horsepower, while the Yamaha YZ250 pumps out 46.08. That is not a tribute to how much power the Yamaha makes but how the KTM engineers detuned their previous 50-horsepower engine in favor of more low and mid. In fact, the 2018 KTM 250SX peaks at 8200 rpm, while the YZ250 hits its peak at 8800 rpm. Given that their peak horsepower is only 1.1 horsepower apart, you might be tempted to think that these two engines are similar across the board. Not so! At 6000 rpm, the KTM makes 2 horses more than the Yamaha. At 7000 rpm, the KTM makes 4 horses more. 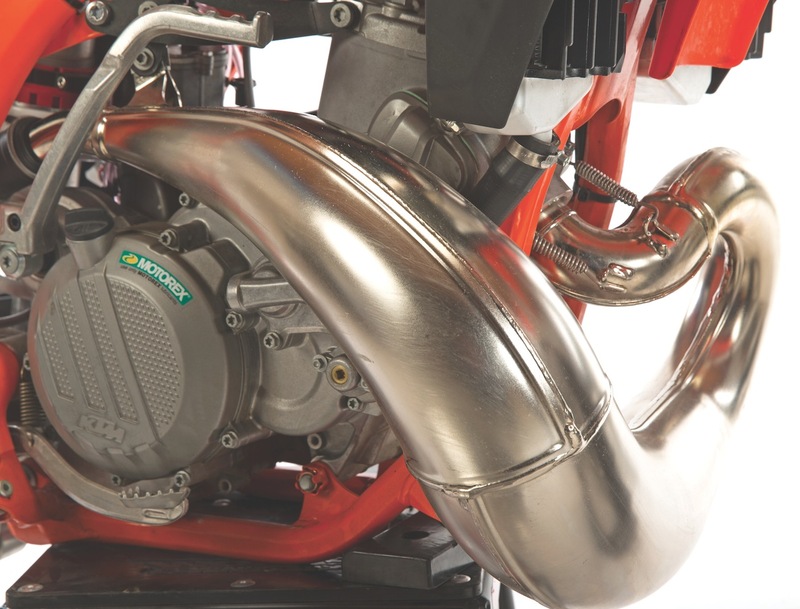 At 8000 rpm, the KTM makes 2.6 horsepower more, and at peak it makes 1.1 horsepower more. When you add in the KTM’s 3 foot-pounds more of torque at 500 rpm lower in the rpm range than the YZ, you get a KTM engine that is quicker, more responsive and has instant throttle response. The fly in the KTM’s ointment is that once the 250SX peaks at 8200 rpm, it falls off quickly. And by the time the orange bike gets to the Yamaha’s 8800 rpm peak, the YZ250 is actually 4.7 horsepower more powerful. The lack of top-end power and over-rev are the hardest things for a rider to adapt to on the KTM 250SX—that and the really strong surge off the bottom. Is the 2018 KTM 250SX better than the 2018 Yamaha YZ250? If we are talking about race bikes, the answer is a resounding “yes.” The 2018 KTM 250SX weighs 7 pounds less, has incredible brakes, features a bulletproof hydraulic clutch, handles better, doesn’t vibrate (thanks to a counter-balancer), has a no-tools airbox (with a plug-in air filter) and is outfitted with Dunlop MX3S tires (instead of old-school MX52s like the YZ250). In short, the 2018 KTM 250SX is a purpose-built race bike. The Yamaha is a workman-like race bike that has changed very little in the last 12 years. That says a lot about how great the Yamaha YZ250 once was, but it is second banana to the KTM now. 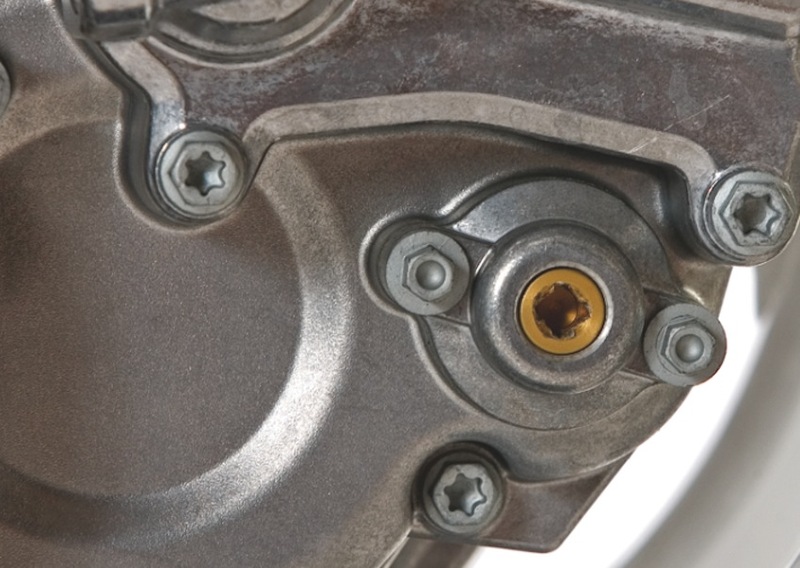 The KTM/Husqvarna two-stroke power valve can be adjusted by turning this brass bolt. Q: WHAT CAN YOU DO IF YOU THINK IT’S TOO POWERFUL DOWN LOW? A: The MXA test riders are split down the middle on the 250SX’s brutal midrange kit. Some love it and some hate it. For those who think it hits too hard, we have solutions. (1) Adjust the power valve. On the starboard side of the engine, in front of the clutch cover, you will find the power valve adjuster. It is the only part on the 250SX that calls for a square wrench (also known as a Robertson or Scrulox wrench). Since this is an odd tool, we used a flat-bladed screwdriver to adjust the power valve. By turning the power valve bolt, you are able to adjust the preload on the power valve spring. The power delivery characteristics of the engine are affected by the timing and speed at which the power valve opens. The ideal power delivery isn’t necessarily the same for all riders or riding conditions, so many riders find it beneficial to alter power delivery characteristics to suit the available traction and their personal preferences. Turn the adjuster counterclockwise for an aggressive hit and maximum top-end power. Turn the adjuster clockwise for smoother power and a broader range of tractable low-to-mid power. The stock setting is one turn in from all the way out. We recommend turning it a quarter-turn at a time (clockwise for a mellow delivery and counterclockwise for an aggressive delivery). Don’t be afraid to try a couple of settings to find what you like. (2) Deprive the engine of air. For test riders who thought the engine was too aggressive, we put tape over the airbox vent on our KTM’s side panel. This strategy may sound strange, but it turns the KTM airbox into a Husqvarna airbox. The hit was made more manageable, and the powerband revved out further. All it takes is a strip of duct tape and one minute of your time. (3) Unplug the secret wire. 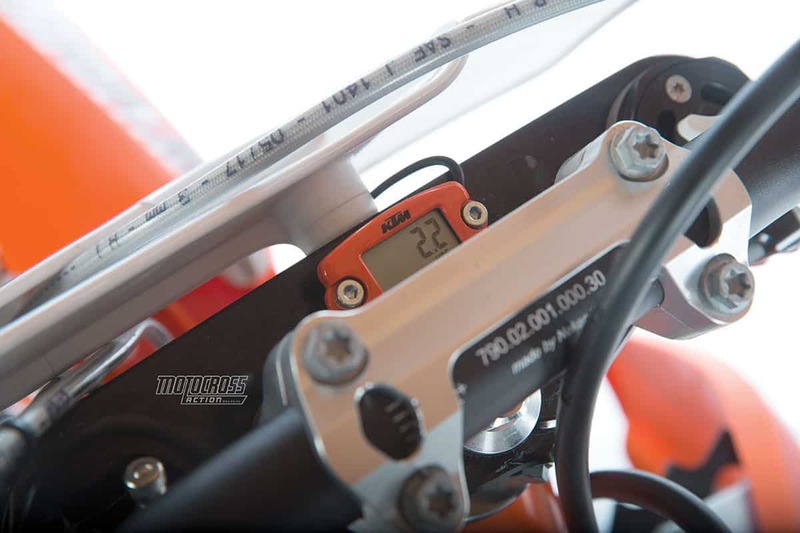 Unlike the KTM four-strokes, the KTM two-strokes do not come with an adjustable map switch; but, what few people know is that they do have two maps. The stock map is the aggressive map, and it comes installed in the bike. There is a mellow map, but it is hidden under the gas tank. Look under the tank, just in front of the cylinder head, and you will see a wire hanging down with a white male/female connector. If you unplug that connector, you will activate the mellow map. We switched the stock 50-tooth rear sprocket for a taller 49-toother. It broadened out the midrange powerband. Q: WHAT IS THE MOST IMPORTANT CHANGE THAT EVERY 250SX RACER SHOULD MAKE? A: Stock gearing on the 250SX is 14/50. The MXA test riders had issues with the lack of top-end over-rev on the 2018 KTM 250SX. Plus, the gear ratios seemed a little off from gear to gear. We killed two birds with one sprocket by gearing the 250SX taller. We switched from the stock 50-tooth rear sprocket to a taller 49-tooth sprocket. This smoothed out the power, lengthened the gap between gears and made the KTM 250SX feel like it pulled higher into the rpm range. It didn’t actually make its power at a higher rpm, but it took longer for the gears to get to the peak horsepower, which was at a fairly low 8200 rpm. The only thing more fun to ride than a KTM 250SX is a KTM 125SX. It’s a feather in the air and a rocket on the ground. Q: WHAT IS THE SECOND-MOST IMPORTANT CHANGE THAT EVERY 250SX RACER SHOULD MAKE? A: Last year, when KTM switched from Keihin PWKs to Mikuni TMXs, we struggled with the jetting. It became a weekly ritual. Eventually, we sought help from JD Jetting and got the bike close. But, shockingly, we found an easier way to fix our jetting problems. In the KTM 250SX owner’s manual, it says to run a gas-to-oil ratio of 60:1. We thought it was a typo and ignored it. But, the more we struggled with the Mikuni jetting, the more the KTM factory mechanics asked us to switch from Maxima at 40:1 to Maxima at 60:1. Finally, we folded and put the stock jetting back in our bike and sent three test riders out on 40:1 fuel. Then, we switched the bikes to 60:1 and—voila!—the 60:1 ratio was better. To make 60:1 premix, you add 10.7 ounces of oil to 5 gallons of gas. The only jetting change we made was to go to a use the air screw to select a new pilot jet size. However, if you are competent at jetting, you can run whatever fuel mixture you want—with a few brass changes. We even have more complicated jetting specs, but they have been developed for specific situations and fuels. Q: HOW DOES THE 2018 KTM 250 HANDLE? 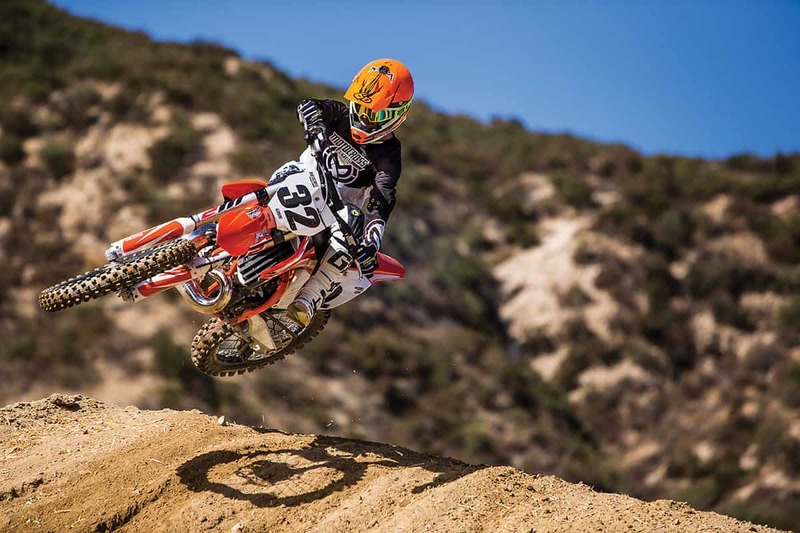 A: The MXA wrecking crew loves the neutral handling of KTM’s 250SXF, 350SXF and 450SXF four-strokes. So, imagine how close to happy land we are on a 212-pound two-stroke that isn’t bound by the front-wheel steering rules of the typical thumper. 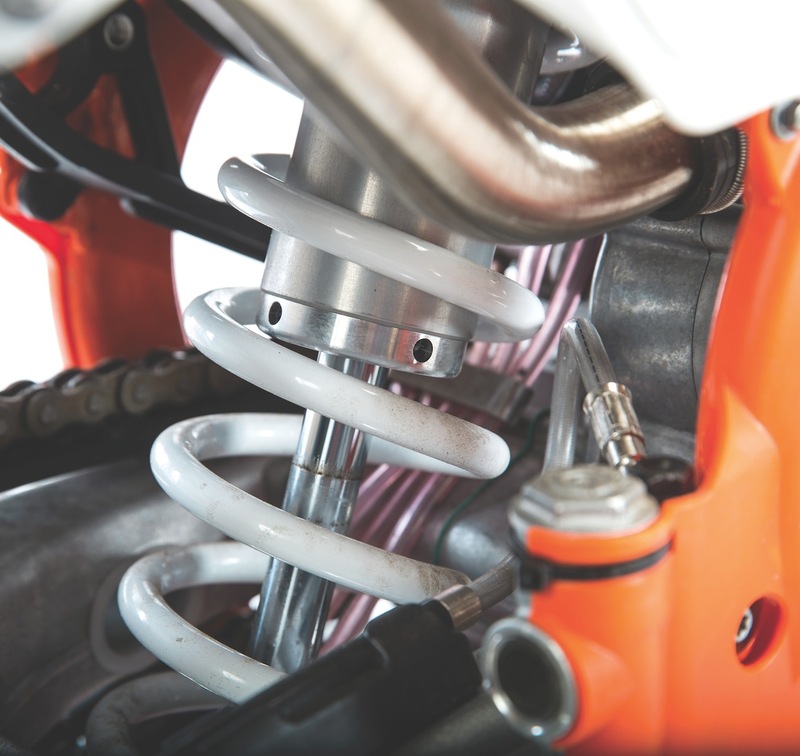 KTM’s chromoly steel chassis is exponentially better with a two-stroke engine than it is with a four-stroke. Lines that you could only watch go by on a four-stroke, you can crank into on a two-stroke. It can make instantaneous cuts, break off berms midway through a turn and slice and dice past the guy in front of you in places he never imagined possible. You haven’t lived until you’ve mastered two-stroke handling, and the KTM 250SX is the best all-around handling smoker on the track. It handles instinctively. You just have to think about choosing a line and it takes it. There is one caveat—you have to fiddle with the fork-leg height to dial in the balance to perfection. 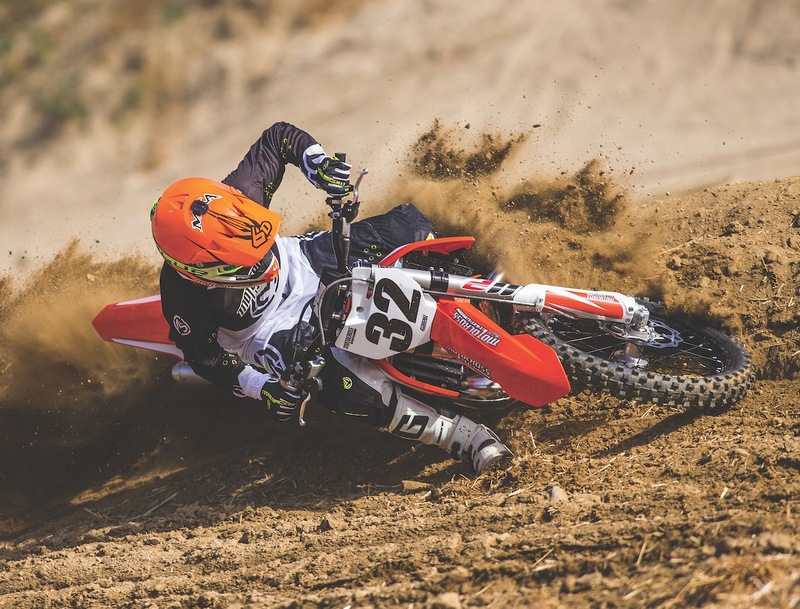 One millimeter in either direction can make a noticeable difference, and it’s not unusual for an MXA test rider to come in from a race and slide his forks down to change the cornering habits for the next moto. 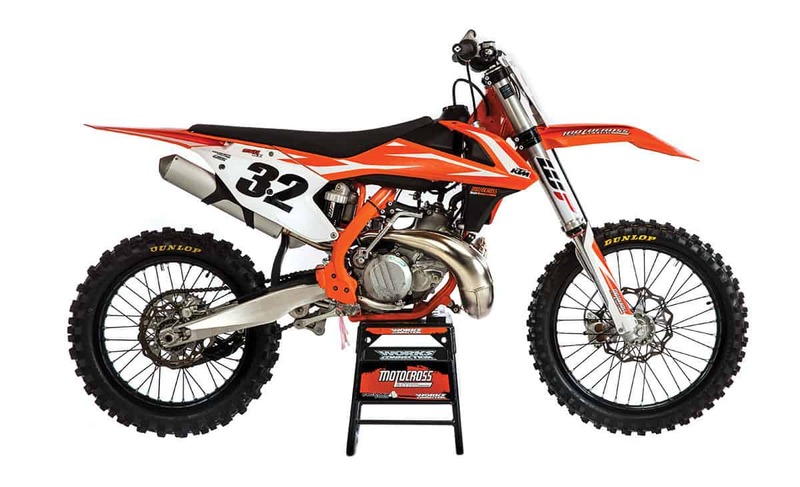 Air forks may be dead at the Japanese brands, but they are alive and kicking at KTM. These are very effective forks. Q: HOW GOOD ARE THE WP AER AIR FORKS? A: The problem with air forks, especially the Kayaba PSF and Showa TAC forks, was that consumers didn’t understand the relationships between the various air chambers. Not only that, but the riders didn’t want to mess with their forks every time the sun came out. Air forks died because they were too complex. KTM’s WP AER air forks are still around because they are amazingly simple to live with. Here is how to make the most of AER forks. First, when you get the bike from your friendly local dealer, put two hours of riding time on it before you make any judgments. Forks, like pistons, need to break in. Second, set the single Schrader valve on top of the left fork cap to the recommended air pressure. The pressure is listed on a sticker on the fork stanchion. Most MXA test riders run lower air pressures than what is suggested by WP. Third, put an O-ring or zip-tie around the right fork leg and go out and ride with the clickers set on 12 and 12. Fourth, after doing a couple laps, come back into the pits and look at the zip-tie. If it is not within 1-1/2 inches of bottoming, lower the air pressure by 2 psi and ride again. Keep lowering the air pressure until you get within 1-1/2 inches of bottoming. Fifth, write down this air pressure number and turn your attention to the compression clickers. Don’t be afraid to make big swings in the number of clicks. Try everything from 6 out to 25 clicks out. Somewhere along the way you will find your sweet spot. The key is to find your best air pressure. Think of this pressure as being the same as whatever coil springs you used to race with back in the day. Did you ever change your coil springs between motos? Didn’t think so. Thus, find the right air pressure for your speed, weight and track, and stick with it. From that point on, all adjustments should be done with the clickers. We think that once you take the time to find your personal setting, you will love these forks—and not just because they are 3 pounds lighter than the forks on a 2018 Honda, Yamaha or Suzuki. Every 2018 KTM comes with an hour meter, but they don’t get to stay at 2.2 hours for very long. (1) Handlebar clamps. In a crash, the bar mounts twist, which deforms the rubber inserts and eventually bends the top one-piece bar mounts. (2) Fork compression clicker. If the clicker arms were longer, the compression could be adjusted with one finger. (3) Seat height. Modern motocross bikes are too tall. Every bike made should be 1 to 2 inches lower. (4) Shock collar. The KTM nylon shock collar is such a bad idea that Suzuki copied it. (5) Air-fork Schrader valve. The position of the WP AER fork’s air valve is hard to reach, and the valve-stem cap almost always falls in the recessed cap. (6) Front master cylinder hose. 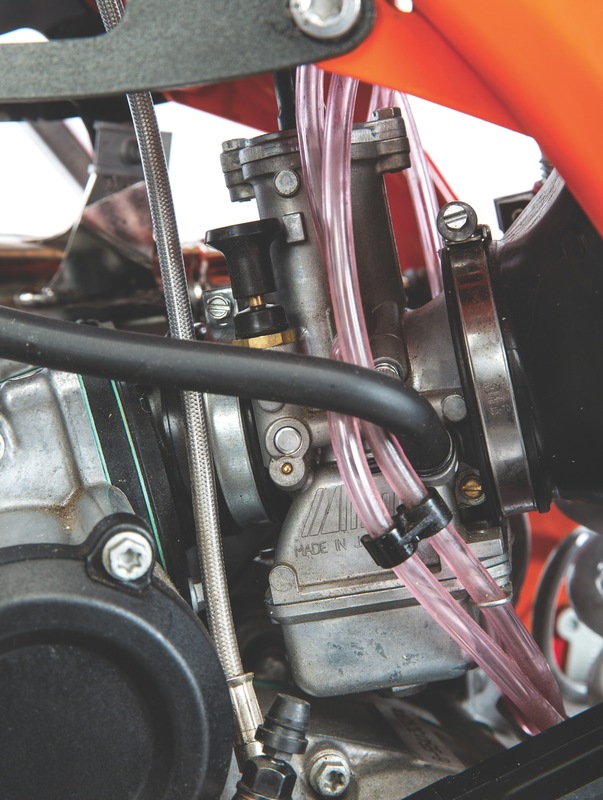 If you hook metal tie-down hooks onto your handlebars and hit a bump in the road, the tie-down hook can crimp the metal tube that comes out of the front master cylinder. (7) Fork-air bleeder. Even if you own a #20 Torx wrench, never use it on the air side of the WP forks. It will strip out. Just use a 10mm T-handle. On the left side, you have to use the #20 Torx. (8) ODI grips. We like the ODI lock-on grips, but, the clutch side is locked on with a #15 Torx. If you want to change the grips, you have to have a #15 Torx wrench. (9) Gas cap. It sticks. (10) Sprocket bolts. Watch the sprocket bolts closely. They come loose all the time (Loctite or not). (11) Spokes. Our KTM spokes never take a set. We check them constantly, even if the bike is just hit by a gust of wind. 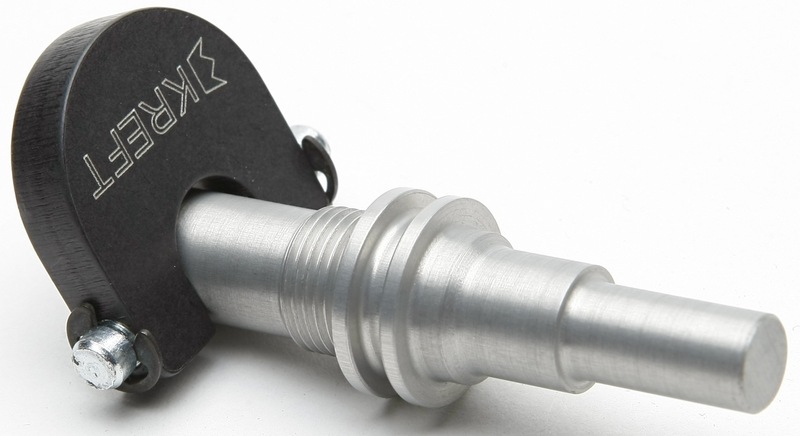 The Kreft Power Dial 2.0 makes engine tuning simpler. (1) Brakes. The best in the class. (2) Hydraulic clutch. 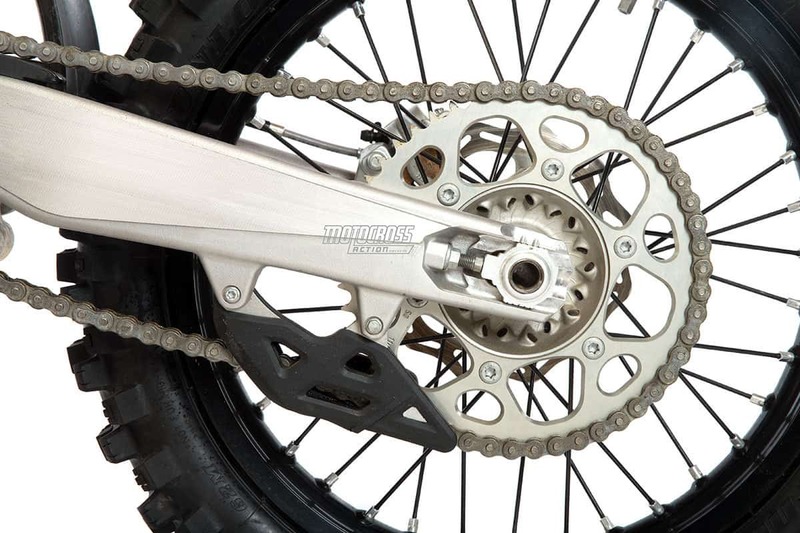 KTM’s self-adjusting, hydraulic, Belleville washer clutch is way ahead of the Japanese clutches. (3) Airbox. We don’t think changing an air filter could get any simpler. Plus, with a few strips of tape, you can turn it into a tuning tool. (4) Forks. We love the WP AER air forks. (5) Tires. The 250SX comes with our favorite tires, the Dunlop Geomax MX3Ss. (6) Power valve. The power valve is a great way to refine the power delivery. But, order a $95.00 Kreft PowerDial so you can make incremental changes in seconds—without the need for a Robertson or Scrulox wrench. (7) Weight. The 2018 KTM 250SX hits the scales at 212 pounds without fuel (which is how the AMA weighs bikes). A: We have long awaited this bike. The new-generation chassis with the reworked 250SX engine and the WP AER fork make for a combination that puts the old-dog YZ250 out to pasture. KTM is making two-strokes fun again. The 2018 KTM 250SX is something you look forward to riding each and every time. This bike is not just good; it’s great. This is how we set up our 2018 KTM 250SX for racing. We offer it as a guide to help you find your own sweet spot. Notes: On big hits at pressures below 144 psi, the forks will bottom out (unless you add oil to the fork). Anything above 144 psi and our testers had no issues with bottoming resistance. Notes: For riders below 185 pounds, start turning out the low-speed compression to get the rear end to settle.